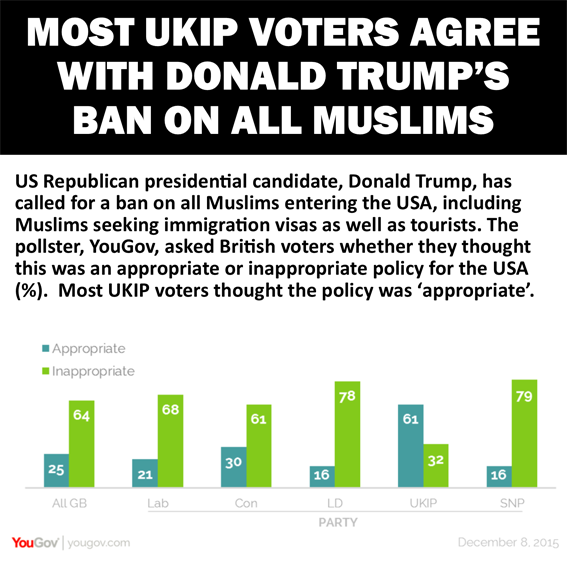 According to a poll of British voters conducted by YouGov, most UKIP voters support a ban on all Muslims entering the USA proposed by Republican presidential hopeful, Donald Trump. Mr Trump this week called for a temporary but complete ban on all Muslims entering the United States, including Muslims seeking immigration visas as well as tourists. YouGov asked British voters whether they thought this was an appropriate or inappropriate policy for the USA. Voters for UKIP, the anti-EU party, topped the poll of those who considered that Donald Trump’s proposed ban on all Muslims was appropriate, with of 61% of UKIPPERS in favour. The overwhelming majority of voters for all the other main parties, however, thought that his ban was inappropriate. Supporters of the Scottish National Party and the Liberal Democrats topped the poll of voters against Mr Trump’s ban. Mr Trump, until last week the front-runner to win the Republican’s nomination to be their presidential candidate, has incurred world-wide criticism for his call to ban all Muslims from entering the USA. The chairman of the Republican Party, the Republican House speaker and the top Senate Republican have all condemned Donald Trump's announcement. Republican House Speaker Paul Ryan said that Mr Trump's comments are "not who we are as a party" and that they violate the Constitution. He added, "Some of our best and biggest allies in this struggle and fight against radical Islam terror are Muslims." Subsequently, Mr Trump - who is defiantly sticking to his controversial proposal - today threatened to leave the Republican party and instead stand as an independent for the post of President. In Britain there has been outrage at Mr Trump’s comments, with London Mayor, Boris Johnson, claiming that he wasn't fit to be president, and UK Prime Minister, David Cameron, stating that his proposal was "divisive, unhelpful and quite simply wrong". A petition to ban Mr Trump from entering the UK has now reached almost 300,000 signatures, meaning that MPs will now have to consider debating the issue. The petition has the backing of Labour home affairs spokesman Jack Dromey and Green Party leader Natalie Bennett, with Conservative MP Sarah Wollaston saying the proposal merited "serious discussion". Despite the majority of UKIP voters supporting the idea of a ban on all Muslims entering the USA, their party leader, Nigel Farage, told the BBC that Mr Trump’s comments were “a political mistake too far” and were “unreasonable”. Last year Mr Farage proposed that migrants with HIV and other serious illnesses should be banned from entering the UK. Earlier this year Mr Farage said he was willing to take a small number of refugees from Syria into the UK, but only if they were Christians.